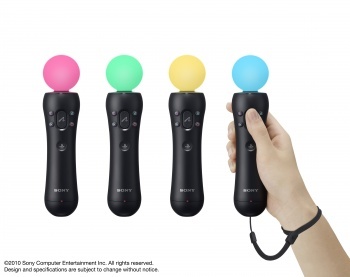 At its E3 2010 press conference, Sony announced that its PlayStation Move motion controller would be coming out on September 19th, and it would be under a hundred smackers. Sony confirmed that its motion controller Move would be beating competitor Microsoft's Kinect to market: It'll be out on the 19th of September. It's also cheaper than the rumored $149 price tag on Kinect: If you already have a PS3 and the PlayStation Eye, Move will cost you $49. If you don't have the Eye, there will be an Eye + Move bundle (including a game) for $99. And if you own none of the above, you've got another bundle: A PS3, PS Move, a PS Eye, and a game for $399. Of course, given that the "nunchuck" apparently costs $30 as well, it might not be cheaper than Kinect if you want to play with multiple people. Still, not bad to start off with. For more, check out our Sony conference liveblog.